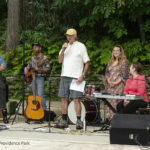 The summer of 2018 will be remembered as the Summer of Rain, and the final concert of the Friends of Glen Providence Park’s 2018 Arts in the Park on September 8 was under threat of cancellation until the last minute. 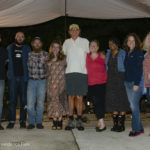 Undaunted by the inclement weather, the six members of Sweetbriar Rose took to the stage under heavy skies and immediately challenged the conditions with Heather Blakeslee’s offer to go start-to-finish, as planned, even if the audience eventually needed to join them on stage, under the canopy, and be entertained with an intimate “unplugged” acoustic concert. The show, as it must, went on, and the rain held out until the absolute very end. And what a show it was! 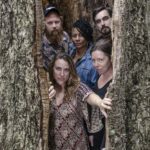 The Sweetbriar Rose set kicked off with the fascinating melancholy of The Ballad of Anna Mae and wove their sweet, soulful magic through original tunes like the eponymous Sweetbriar Rose and the title track of their new album, Black Eyed Susan. 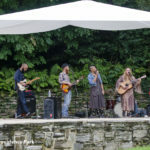 The Friends of Glen Providence Park would like to thank Sweetbriar Rose for wrapping up our 2018 Arts in the Park season with such a finely crafted and entertaining show. And yes, the Show will go on! 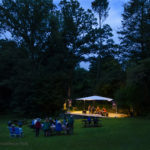 …so we’ll see you in summer 2019 for our eighth year of Arts in the Park concerts. 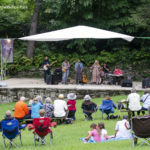 Many thanks to all who made this concert possible: Delaware County Parks & Recreation, a grant from the Pennsylvania Council on the Arts, Concert Series Sponsor Media Recreation Board, Concert Sponsor Seven Stones Gallery, our volunteer Concert Committee, Marcia Tate for her artful decoration of the stage, the hundreds of people who attended, and of course Sweetbriar Rose!